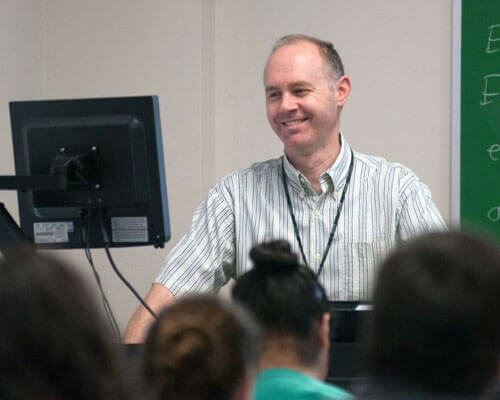 Home » Academics » Schools » College of Arts, Humanities and Social Sciences » Faculty » Mark Lokensgard, Ph.D.
Mark Alan Lokensgard is founder of the Portuguese program at St. Mary’s. He directs the Brazil portion of the Southern Cone Studies Program and the Brazil Semester Study Program in Curitiba, Brazil. He has served as the Chair of the Department of Languages, on the Executive Council of the Brazilian Studies Association (BRASA), and as Program Chair for the Tenth Congress of BRASA (Brasília, July 2010). He has published articles on Luso-Brazilian literature and culture and on Portuguese language instruction in Letras de Hoje, Cadernos Literários Romance Notes, Portuguese Studies, the Luso-Brazilian Review, and the collection Portuguese for Spanish Speakers/Português Para Falantes de Espanhol. He also appeared on the MLA radio program “What’s the Word?” to discuss modern Brazilian cinema. His translations of Brazilian poetry and prose have been published by Gávea-Brown and in the Oxford Book of Latin American Poetry (2009). He was awarded a Fulbright Lecturing Award to teach at the Center for American Studies at the Fundação Armando Álvares Penteado (FAAP) in São Paulo, Brazil, during the spring of 2010. His current research interests are representations of the law in Brazilian literature and cinema, Theory of Mind in the humanities, and cultural competency.